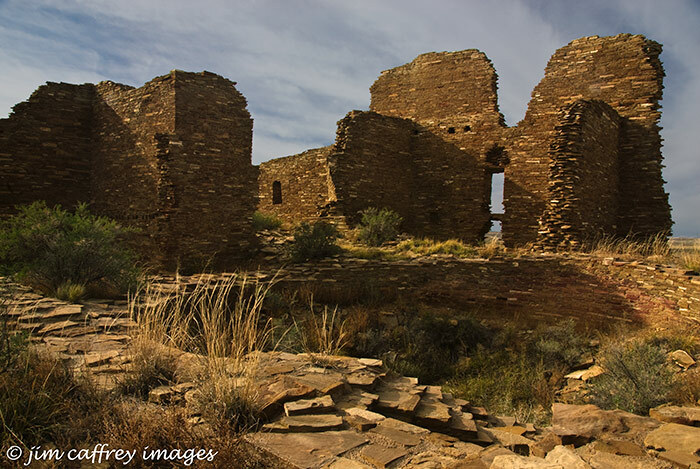 The first time I visited Pueblo Bonito in Chaco Canyon, I was overwhelmed by a sense of gratitude. I felt such a connection to the people who built this amazing place, and I silently thanked them for building it strong enough to withstand the ravages of time so I could stand in awe of their craftsmanship a thousand years later. This first image was made at the southeast corner of the pueblo. 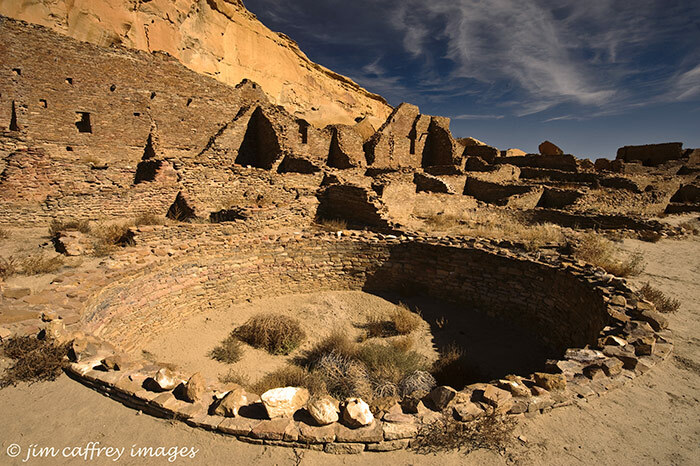 Pueblo Bonito is the largest of a number of Greathouses in Chaco Canyon built by the ancestors of the present-day pueblo people of northern New Mexico. 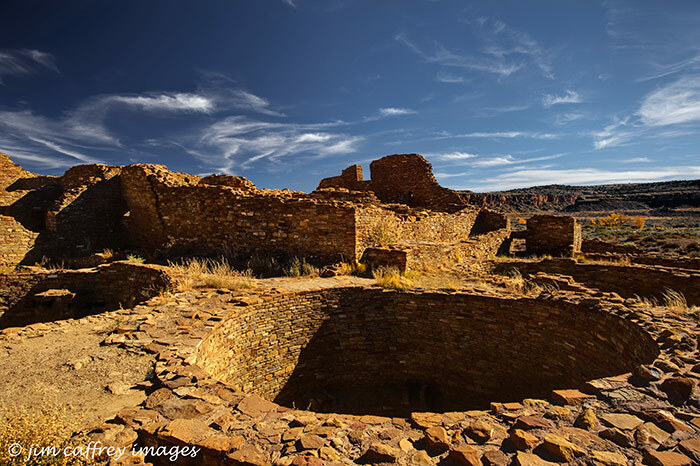 At the time it was built, the Anasazi’s territory covered a large area which spanned the entire Four Corners region. 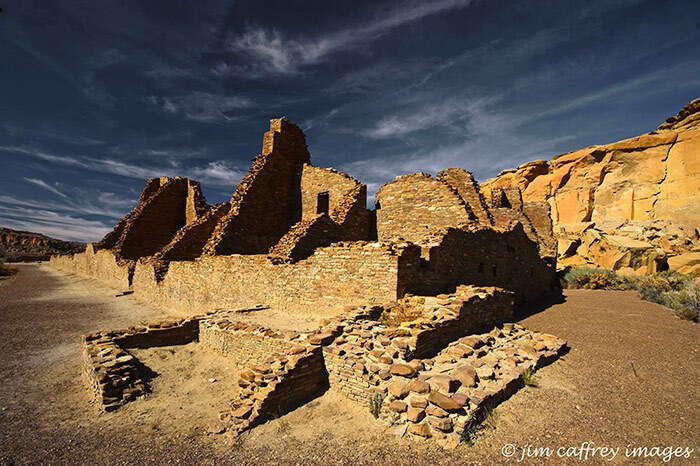 Chaco Canyon contained several pueblos, and is thought to have been a gathering place for religious ceremony and trading. Pueblo Bonito may have been used to house visitors as well as a large population of the local people. It was four to five stories high in some places, contained nearly eight hundred rooms, and was capable of accommodating several thousand. This is an image of one of the thirty seven kivas in Pueblo Bonito; two of them, the great kivas, were used for ceremony. The rest were used as gathering places, similar to our present-day family or living rooms. They were, for the most part, constructed underground –the word kiva means “world below”, and had roofs constructed of vigas, latillas, and mud. Access was by means of a ladder through an opening in the roof. This image shows a section of the long, curving back wall of the complex. The builders who designed Pueblo Bonito used core and veneer architectural techniques, making the walls of the lower levels up to three feet thick. These massive walls were capable of supporting more levels above as the structure grew in size over the centuries. 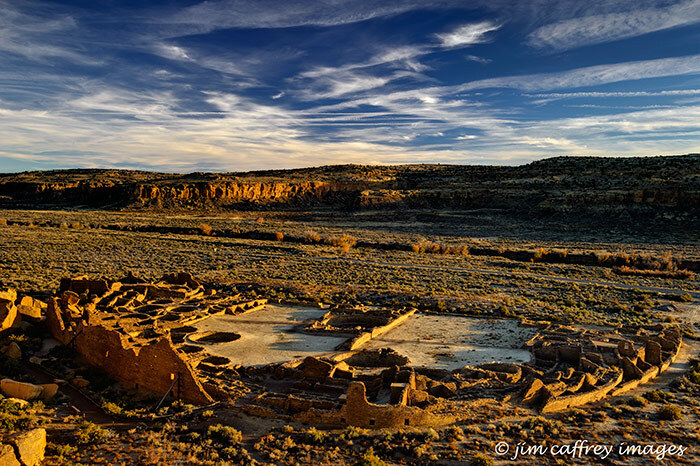 This last image was made from the top of the mesa behind the pueblo; it shows the entire complex, and the semi-circular design of the structure. The center wall divided the whole into two symmetrical halves, and was a design element in many of the pueblos of this era. 1. Wikipedia contributors. “Ancient Pueblo Peoples.” Wikipedia, The Free Encyclopedia. Wikipedia, The Free Encyclopedia, 9 Mar. 2011. Web. 10 Mar. 2011. This an image of one of the kivas in Pueblo Bonito at Chaco Canyon. The literal translation of the word kiva is “world below”. It is thought that they served as gathering places. Some of the smaller kivas may have served as living areas, and the larger ones as sacred places for religious ceremonies. 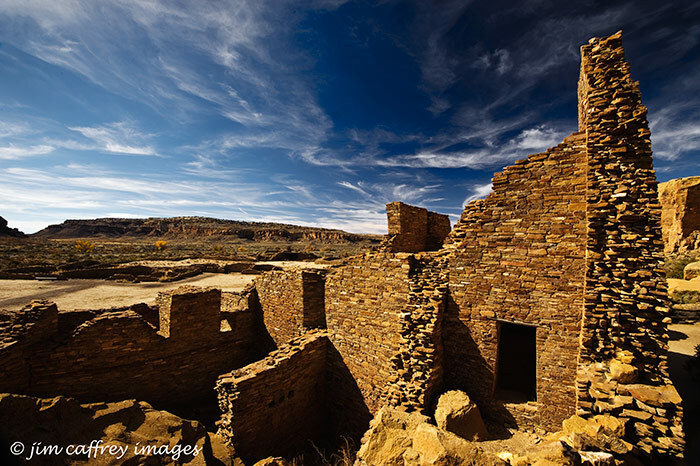 There are thirty-seven kivas in Pueblo Bonito alone, and well over a hundred in Chaco Canyon. The largest at Casa Rinconada is 19 meters in diameter, and has a window which is aligned with the rising sun on the summer solstice. The light from the window shines on a recessed niche in the opposite wall. This is just one of the amazingly accurate architectural/archeological features found in Chaco Canyon.